As part of the US Navy's acoustic reverberation special research program (ARSRP), sponsored by the Office of Naval Research (ONR), an area on the northern Mid-Atlantic Ridge has been designated as a natural laboratory. This area is a natural reverberation site because its steep rock inclines, deep subsurface structures and sediment structure provide opportunities to study many aspects of bottom reverberation. The resulting data have permitted detailed comparisons with numerical codes of bistatic reverberation (e.g. Smith et al, 1993). Ellis and Crowe (1991) combined Lambert's law scattering with a surface-scattering function based on the Kirchhoff approximation to obtain a new functional form that allowed a reasonable extension from backscattering to a general, 3D scattering function useful in bistatic-reverberation calculations. This new functional form was tested in a bistatic version of the GSM and was shown to be an improvement over two other commonly used methods, neither of which included azimuthal dependence: the separable approximation and the half-angle approximation. In long-range acoustic propagation problems in the deep ocean, interactions with the sea floor generally occur at subcritical grazing angles. Under conditions of smooth basaltic surfaces and low grazing angles, most waterborne energy should be internally reflected. Furthermore, the scattering functions should be monotonic with respect to grazing angle, as would be predicted by Lambert's law. However, in ocean areas characterized by a flat, basaltic sea floor, the observed scattering functions are not always monotonic with respect to angle. Rather, peaks in the scattering functions sometimes occur at angles corresponding to compressional and shear head (or interface) wave propagation. In order to investigate this seemingly anomalous behavior, Swift and Stephen (1994) generated scattering functions using a model that also included volumetric heterogeneities below a flat, basaltic sea floor. They executed the model over a wide range of length scales for the embedded scatterers when ensonified by a Gaussian pulse beam at a grazing angle of 15°. At this angle, a truly homogeneous sea floor composed of basaltic rocks would produce total internal reflection. However, they found that bottom models containing 10 percent velocity perturbations (representing the volumetric heterogeneities) produced significant levels of upward-scattered energy. In reality, energy leaks below the sea floor as an evanescent phase existing only when the incident energy is subcritical, and this energy only penetrates to depths of a few wavelengths. Interactions between this energy and those volumetric heterogeneities just below the surface excite interface waves (as well as compressional and shear waves in the bottom), in agreement with the observed scattering functions. Swift and Stephen (1994) also found that the scattering functions were influenced by the presence of velocity gradients (both compressional and shear) below the sea floor. Specifically, in the absence of velocity gradients, bottom-propagated energy is not refracted upward. Thus, it interacts with yet deeper velocity anomalies and produces greater scattering. 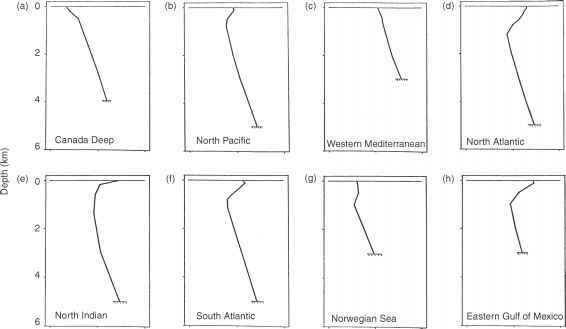 Greaves and Stephen (1997) determined that a sea-floor dip on the scale of a few hundred meters influenced, but did not determine, scattering strength. This suggested that other characteristics of steeply dipping areas, such as subsurface properties or smaller-scale surface features, strongly affected the level of backscattered signals. Greaves and Stephen (2000) advanced this work in an extended analysis of ARSRP data to examine reverberation at low-grazing angles from rough and heterogeneous seafloors. The presence of plant life on the sea floor can complicate the scattering processes at the bottom boundary of the ocean. In a theoretical study, Shenderov (1998) treated acoustical scattering by algae as the diffraction of sound waves on a random system of 3D, bent, elastic bodies. This approach considered the statistical properties of algae. McCarthy and Sabol (2000) characterized submerged aquatic vegetation in terms of military and environmental monitoring applications. The utility of the reverberation field as an inverse sensing technique is analogous to that of the ambient noise field (Chapter 6, Section 6.6). Makris (1993), for example, inverted the reverberation field to image the sea floor. This was accomplished by using simultaneous inversions of multiple reverberation measurements made at different locations. The outputs of the inversion can include optimally resolved reverberation, scattering coefficients or physical properties of the sea floor. Through simulation, Makris (1993) demonstrated the utility of this method for determining bottom-scattering strengths using a monostatic-observation geometry together with operational parameters obtained from bottom-reverberation experiments sponsored by the ONR special research program. First, a synthetic ocean basin was created using a representation of scattering coefficients. Next, the true scattering coefficients were estimated from the observed reverberation maps using a global inversion method. This method is applicable to many monostatic and bistatic experimental geometries, although it cannot be used arbitrarily since a series of separate inversions is necessary to determine the angular dependence of the bottom reverberation. Specifically, for each inversion the separation between observations must be small enough to maintain a similar orientation relative to the imaged region. It may be possible to plan an optimal set of experimental observations by considering measurement-resolution constraints, platform maneuverability, time and observation sites by solving what W.A. Kuperman referred to as the "traveling acoustician problem" (Makris, 1993: 992).